Did you know that Straight Talk now has add on data? I recently switched to Straight Talk’s $35 Plan with Unlimited Talk and Text with 2 GB of high speed 4G LTE data. And when I did I updated Straight Talk’s My Account app because I hadn’t used it in a long time. While checking out the app, I decided look around and when I tapped Buy Airtime I saw an option for Data Add On. There are two options, one to add 1 GB for $5 and another to add 2 GB for $10. The app shows the data lasts for zero days but what they really mean is that this data does not expire. Now I haven’t tried this option yet, so I don’t know if it works so I still need to do that. But I was really surprised to see this option and even more surprised its not listed in the plan features on the straighttalk.com. This feature is a big deal for people that sometimes run out of data. 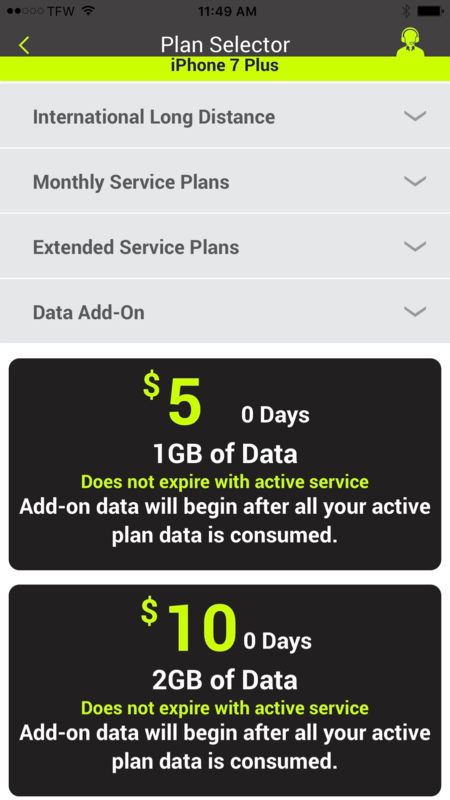 Five dollars is a pretty good price for add on data. I would have like to see them match Total Wireless’s 3GB for $10 though. They aren’t offering you a better price for adding 2GB here, perhaps it’s now just simpler to buy more data than having to constantly add and pay for data in 1GB increments. So Straight Talk’s add on data is $5 per GB, half the price of tracfone’s $10 GB. It’s still not a good a deal as Total Wireless’ 3Gb for $10. And you know I am now wondering if Net 10 has added this feature too. Alright what about you? Have you tried adding data to your Straight Talk account? Did it work? Any side effects? Leave a comment below and share. I have been trying to figure out how to do this. Can someone please advise me? You should be able to buy it from the Straight Talk My Account App or by logging into your account on straighttalk.com. I have been trying to figure out how to do this. I have been using my phone as a wifi hot spot at home as i don’t yet have internet service. Can someone please tell how to get this? I just did the 2 gb add on earlier today. This add on data is NOT high speed. I can barely get Facebook or chrome to load. I feel like I got ripped off. If you ran out of data, you would still have slow 2G data. If you then purchased 2GB of add on data you data should return to high speed data. If you are still getting the same slow 2G data speeds, it sounds like something is wrong. Try restarting your phone. If the data is still slow, try contacting Straight Talk customer service. Tell them the data you bought is the same speed as the 2G data and ask for a refund or account credit. Glad it worked out for you. Thanks for sharing your experience adding data. Comments like yours help others trying to add data. Bob, I did it! I kept at it until I got the app installed. Then I “explored” all over it, looked at each option and then finally saw the place where you click to buy 1 G of data for $5. I didn’t click because I’m not out of data yet. I think it said that it goes into effect like a reserve does, when you use up the original data in your plan. Nice work. you should be able to add data when you need it. When you run out of data, you might be able to use the app to add data because you’ll still have the slow 2G data, or you can go somewhere and connect to wifi and use the app to add data. Bob, I just recently purchased the same plan you did ($35 with 2 G of data). I had to upgrade to a smartphone from my old phone, of course. I am interested in the option to purchase extra data. I assume you have to do this on the phone itself by downloading the APP from 611611…? I also saw a post about purchasing extra data from Walmart that is emailed to you? You heard anything about that? Thanks. I checked walmart.com and I didn’t see add on cards with email delivery to add data to your Straight Talk plan. They have a number of data cards there but they are for tablets and mobile hotspot devices, so I wouldn’t do that to avoid ordering the wrong card. But if your savvy enough to order something like that online from walmart.com you could log into straighttalk.com and add a plan to your account there and choose the extra data. If are already enrolled in auto refill, you may want to install the My Account app on your phone and add data using the app. They have an app for iPhone in the App Store and an app in the Google Play store for Samsung and other phones that use android. Texting APP to 611611 should return a message with a link to the app for your phone. When you tap it it should open the app in the appropriate store app on your phone and from there you can install it. It’s not too hard to do, if you haven’t installed an app on your phone before ask a friend or family member that has to walk through it with you. Its pretty easy to do. Let me know how it goes. Bob, thanks for the info. I appreciate it. I am new to this “smartphone stuff” so I am not so savvy with it. I am grateful for any info or assistance I can get. I think my best bet would be to text the APP to 611611. I am enrolled in auto refill. If I purchase 1 gig of extra data through that app, will they put it in “reserve” or go ahead and put it in the phone? In other words, do you have to exhaust all of your 2G of data in your plan before that extra gig becomes available? I’m not sure I asked that question correctly, but bear with me. I’m learning. Thanks. I haven’t used the feature yet myself. The way it is supposed to work is that you add the data and it starts getting used when you run out of data. They don’t call it reserve, they add it to your account and it doesn’t expires or rolls-over. Someone told me they added it and then couldn’t see it in their account after. So let me be clear about one point. Let me ask my other reader about it. If you use your phone with Wi-Fi at home or work you can add it when on wi-fi, or using the super slow data Straight Talk gives you when you data runs out. I’d say start by installing the app and logging in to your account first. I am assuming you haven’t run out of data and are in a hurry to buy data right away. Bob, I did try to download APP from 611611. I got a message that said I had to “connect to URL”. Well, that stopped me right there, because I didn’t know what that meant. That saying I tried to purchase data a week prior to that and got an error 5 times. Once online, once on the phone using the automated system then 3 more times when a representative tried for me. It never worked. Told me to call back and try again in 24 hours. Checked my card the next day and had 5 separate $5 charges on my debit account. So if you ever get an error message with a phone number after using your card, don’t try again and check your account because it’s a good chance you were charged. Read an article where someone was charged twice and their father once (3 separate charges) for a phone the same way. I have yet to try it. Thanks for sharing your experience. I wonder how many customers even know the option exists. Sounds like they have bugs to work out still. I’ve purchased 1gb and it didn’t show up either. I think it kicks in when you max out of your current data. Now the rollover part I’m not sure about. I would like to see how that works. I’m thinking it expires with the next monthly data. But when I texted USAGE to 611611 it showed me how much data I’ve used this cycle and let me know that I had the 1gb in reserve that I purchased for $5. thanks for the comment. If possible please do let me know if this gets resolved. They really need to correct that.